This pasta recipe is there for me at any time of day or night. It started as a middle of the night cooking experiment after being out at a party. My boyfriend and I came home late and hungry, so we sat down in the kitchen over a bowl of pasta with ricotta, lemon zest, basil and crushed pepper. This became a standard post-party hunger salvation. The inspiration for this combination came from our last trip to Malta. We had just come back from our regular summer stay on this beautiful Mediterranean island where my boyfriend’s family is from. 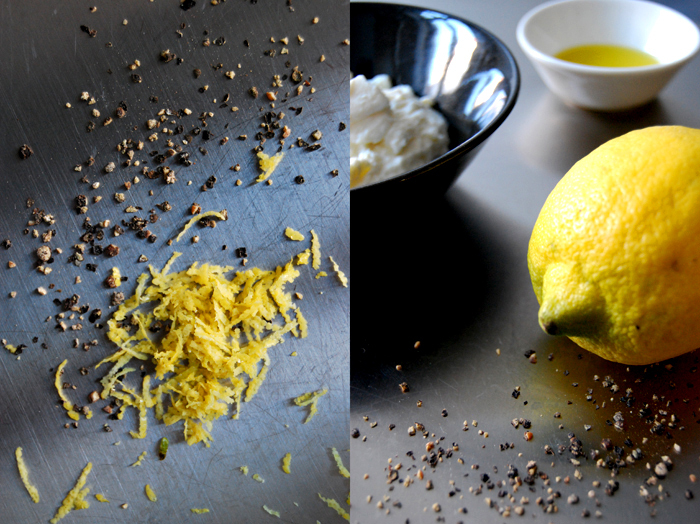 Ricotta, lemon, basil and the bold use of roughly crushed pepper are essential ingredients of Maltese cooking as well as fennel seeds, the best tomatoes in the world (together with Maltese potatoes) and lots of herbs. Another treat I always look forward to is Qassata, a savory ricotta filled pastry spiced with crushed pepper and parsley. We make our own when we don’t have a Maltese bakery close by (in other words, the rest of the year), I’ll write about it soon! Back to the pasta, I normally throw in a handful of freshly chopped basil but my plant had just given its last leaves so I had to do without. Mix the cooked pasta with a dash of olive oil, season with salt and pepper and divide between the two plates. 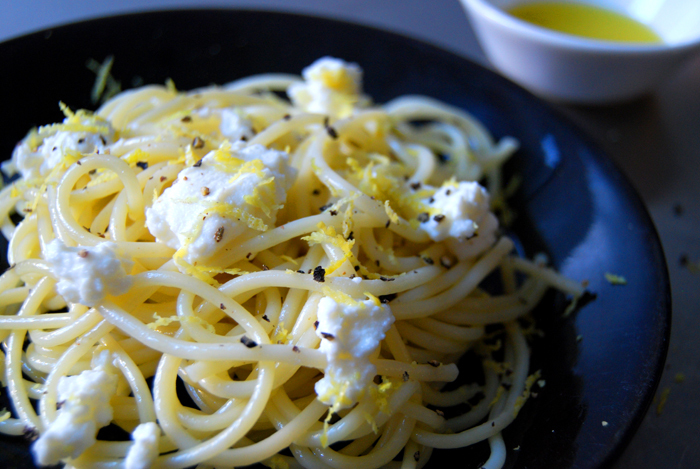 I prefer to mix the pasta with the ricotta on each plate and not all together, therefore, I add a couple spoons on top of each spaghetti portion and sprinkle with the lemon zest and basil. I always offer some more crushed pepper and salt with it. Wow, one of the best ways to enjoy spaghetty! Great! Thank you Nina! We love it as well, it’s one of our favourites! Thanks Julia! How sweet that you made it for the 2 of you! I’m happy you enjoyed it! Made this for my mama today! It was great, we really enjoyed it 🙂 Thanks eat in my kitchen for the great ideas!